McDonald's Holiday Pie finds itself back on the menu at select locations for the 2018 holiday season. 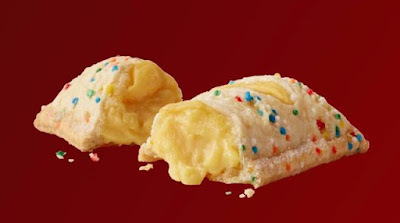 The Holiday Pie features a sugar cookie-like crust embedded with rainbow nonpareils and filled with custard. While prices may vary, the pies are available for 89 cents a piece or two for $1.50 here in Southern California (may vary). You can find my review of the Holiday Pie here.